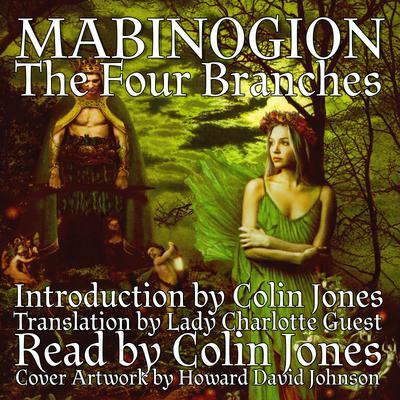 The Lady Charlotte Guest translation of the original Four Branches of the Mabinogion with introductory notes by Colin Jones. After reading, recording, and listening to the Four Branches of the Mabinogion, I'm amazed that the world isn't full of Manga comics, Hollywood blockbusters, bestselling novels, sticker collections, trading cards, and fantasy role-playing games based on this quite astonishing collection of Welsh tales. The breadth and imagination of these stories is really quite amazing - How many other stories can boast such a heady collection of wizards, body-swapping, bitter curses, deep revenge lasting for generations, a giant, a cauldron of immortality, murder plots, princes, kings and even pig-embezzlement? Not to mention a woman made from flowers by two wizards as a wife for a man cursed by his mother from ever marrying another human being. A man who can only be killed by a spear which has been crafted for one year and this while he stands with one leg on a bath and the other on the back of a young goat? The Mabinogion is a collection of tales, told over generations, recorded in two manuscripts; Llyfr Coch Hergest (the Red Book of Hergest) and Llyfr Gwyn Rhydderch (The White Book of Rhydderch). Translated into English by Lady Charlotte Guest, they contain a large number of tales from the Welsh storytelling tradition. Strictly speaking, however, the term Mabinogi (Mabinogion was mistakenly taken as the plural of Mabinogi by Lady Charlotte Guest) refers to the Four Branches recorded here. The Mabinogion begins with the tale of Pwyll, Prince of Dyfed. Pwyll changes places with a King of Annwfn, the Otherworld. He also meets Rhiannon for the first time, who appears on a charmed horse which cannot be caught by even the fastest rider. The Third Branch a castle appears where none has ever been seen before, charms are cast and deep revenge is played out. Long before the stories were ever written down, Welsh storytellers would enthrall audiences with tales of Pwyll, Rhiannon, Bendigeidfran, Branwen, and their adventures. I hope this collection captures the spirit and wonder of these ancient tales.